Robert Hirst, general editor of the Mark Twain Project at UC Berkeley’s Bancroft Library, went to Washington, D.C., this week. He shared with folks around the Beltway the story of the production of the first volume of the autobiography of legendary American author and humorist Samuel Langhorne Clemens, best known by his pen name Mark Twain. 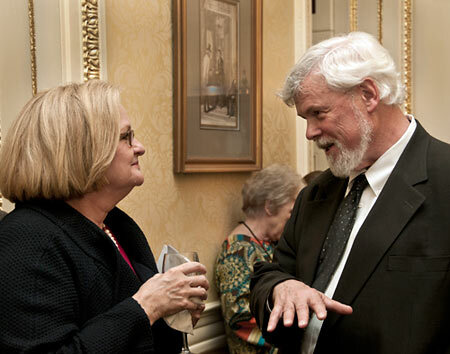 Robert Hirst meets Missouri Senator Claire McCaskill. Photo courtesy of the NEH. Hirst delivered two talks about the publication of the “Autobiography of Mark Twain: The Complete and Authoritative Edition, Vol. 1” on Wednesday (Feb. 16). The first was at the headquarters of the National Endowment for the Humanities (NEH) and the second was on Capitol Hill, where Hirst was introduced by Claire McCaskill, a fourth-generation Missourian and senator from Twain’s home state. Hirst said he was invited by the NEH, which he said “has been unstinting in its support for the Mark Twain project since 1967.” Since 1980, the endowment’s support has been contingent, in part, on increased support from the University of California, The Friends of The Bancroft Library, and from individuals and foundations. Talks from capitol corridors to the Calaveras County, Calif., home of Twain’s “Jumping Frog,” have become an increasing part of Hirst’s busy schedule since the book hit the shelves in November and became a best-seller. More information about the autobiography is online. Details about support for the Mark Twain Project and membership in the Mark Twain Luncheon Club are also available.